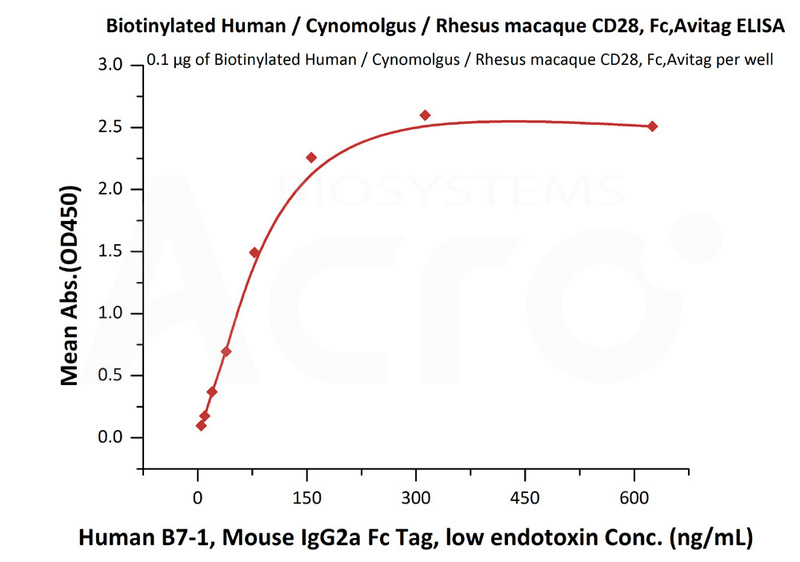 Biotinylated Human / Cynomolgus / Rhesus macaque CD28, Fc Tag (CD8-H82F2) is expressed from human 293 cells (HEK293). It contains AA Asn 19 - Pro 152 (Accession # AAH93698). In the region Asn 19 - Pro 152, the AA sequence of Human, Cynomolgus and Rhesus macaque, CD28 are homologus. The protein has a calculated MW of 43.6 kDa. As a result of glycosylation, the protein migrates as 55-66 kDa under reducing (R) condition, and 110-130 kDa under non-reducing (NR) condition (SDS-PAGE). 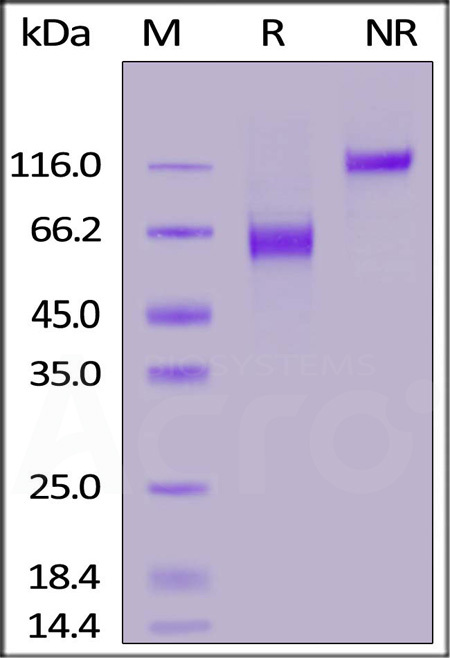 Biotinylated Human / Cynomolgus / Rhesus macaque CD28, Fc Tag on SDS-PAGE under reducing (R) and non-reducing (NR) conditions. The gel was stained overnight with Coomassie Blue. The purity of the protein is greater than 95%. Immobilized Human B7-2, Fc Tag (Cat. No. 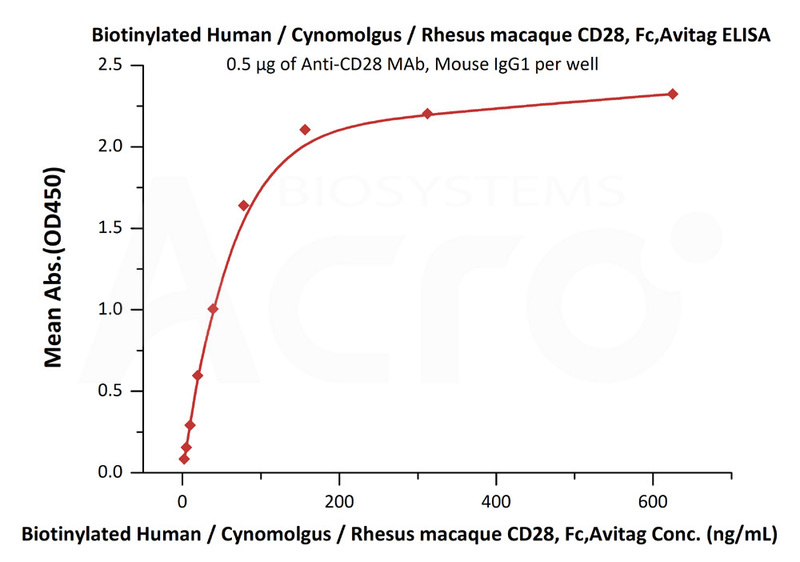 CD6-H5257) at 5 μg/mL (100 μL/well) can bind Biotinylated Human / Cynomolgus / Rhesus macaque CD28, Fc Tag (Cat. No. CD8-H82F2) with a linear range of 0.15-5 μg/mL (QC tested). Immobilized Anti-CD28 MAb, Mouse IgG1 at 5 μg/mL (100 μL/well) can bind Biotinylated Human / Cynomolgus / Rhesus macaque CD28, Fc Tag (Cat. No. CD8-H82F2) with a linear range of 2.4-39 ng/mL (Routinely tested). Immobilized Human B7-1, Fc Tag (Cat. No. 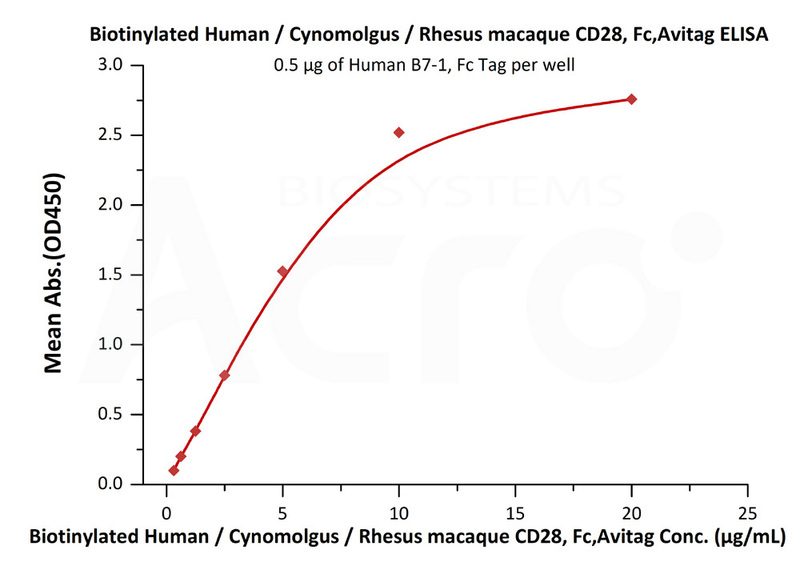 B71-H5259) at 5 μg/mL (100 μL/well) can bind Biotinylated Human / Cynomolgus / Rhesus macaque CD28, Fc Tag (Cat. No. CD8-H82F2) with a linear range of 0.313-5 μg/mL (Routinely tested). Authors: G Aravindhan, et al. T-cell-specific surface glycoprotein CD28 is also known as TP44, is a single-pass type I membrane protein which contains one Ig-like V-type (immunoglobulin-like) domain. is one of the molecules expressed on T cells that provide co-stimulatory signals, which are required for T cell activation. CD28 is the receptor for CD80 (B7.1) and CD86 (B7.2). When activated by Toll-like receptor ligands, the CD80 expression is upregulated in antigen presenting cells (APCs). The CD86 expression on antigen presenting cells is constitutive. CD28 is the only B7 receptor constitutively expressed on naive T cells. (1) Woerly G., et al., 2002, J Leukoc Biol 72 (4): 769–79. (2) Nunès, J A., et al., 1996, J. Biol. Chem. (UNITED STATES) 271 (3): 1591–8. (3) Ellis, J H., et al., 2000, J. Immunol. (UNITED STATES) 164 (11): 5805–14.